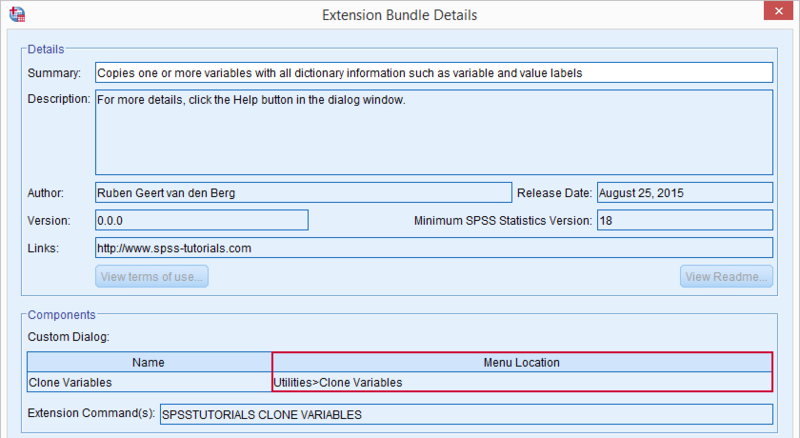 SPSS Extension Bundles are extra program features that you can add to SPSS. Like so, you can add data editing routines, statistical procedures or other features that the program does not include by default. Most extensions are freely downloadable. You can also write and distribute your own Extension Bundles but doing so is reasonably challenging. Different SPSS users have different needs with regard to the program. Although SPSS includes a lot of handy routines by default, including all features desired by all users just isn't doable. The solution to this problem is that SPSS enables users to create and distribute their own additional program features in the form of SPSS Extension Bundles. We'll later discuss precisely what Extension Bundles are from a technical point of view. First, we'll show how you can install and use Extension Bundles. SPSS Extension Bundles - Where to Get Them? Most of the tools on our website are currently in the form of SPSS Custom Dialogs but we'll gradually convert the most important ones into Extension Bundles during the remainder of 2015. A vast collection of freely downloadable extensions are available from IBM SPSS. SPSS Extension Bundles - How to Install Them? The most recent SPSS versions allow you to download and install extensions from within SPSS. However, we personally prefer downloading our extensions manually first. Like so, we can include them in our project folder and make sure they get backed up with the other project files. If the project ever needs to be replicated -perhaps on a different computer- we can be confident that the necessary extensions will be readily available. Installing extensions just couldn't be easier: select Utilities Extension Bundles Install Extension Bundle and navigate to the bundle you'd like to install. Its file name ends in “.spe”, which is short for SPSS Extension. Many extensions require either the SPSS Python Essentials or the R plugin. If you're not sure whether these are needed have been installed, just try and install the extension. SPSS will then check for you whether all prerequisites are present and -if not- draw your attention to any missing components as shown below. SPSS Extension Bundles - How to Use Them? Good question. However, there's no general answer to it; just as the purposes of extensions differ widely, so do their interfaces. But then again, many extensions come with a dialog window. If well designed, the dialog window will tell you how to use it, as shown below. If that's insufficient, try clicking the Help button (it may be greyed out if the author didn't add a help file) or Google for information. If everything else fails, try and contact the author: select Utilities Extension Bundles View installed Extension Bundles. In the window that pops up, each installed extension has a link which will open some general information on the extension, including its author and -possibly- a URL. It also tells you where in SPSS’ menu you'll find the extension interface. SPSS Extension Bundles - What Are They? Technically, extensions are archive files: ‘zipped’ folders. If you're curious what's inside, their contents can be extracted with 7 Zip and a myriad of other programs. Part of many extensions is an .xml file which defines a new SPSS syntax command. After installing the extension, it will function no differently from SPSS commands that are included in the program by default such as FREQUENCIES or COMPUTE. In fact, you may even redefine what these commands do with an extension. Not recommended. Further, extensions often contain an SPSS custom dialog, recognizable by its file name ending with “.spd”. Finally, a Python module (.py file) may be present containing the actual program powering the extension. First off: for setting decimal places in SPSS 22 or higher, the best way is OUTPUT MODIFY. For an alternative, take a look at our Set Decimals for Output Tables Tool. Your comments hadn't been published yet so no worries, I'll thrash them. Thanks for your comments and enjoy the rest of your weekend! Hi Huseyin! Thanks for your comment. I don't work with R you I can't really assist you with that -all our extensions use Python or plain SPSS syntax. However, if you do find an R based extension, you can unzip the .spe file with 7-zip and take a look at which files it contains and how they relate. Mind you that building SPSS extensions is challenging and may take a lot of practice before you'll get it right.